Chris Richard is a Los Angeles-based freelance journalist. He writes about criminal justice, health and the environment. 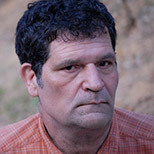 His work has appeared in The California Report, The California Health Report, Grist and The Christian Science Monitor.